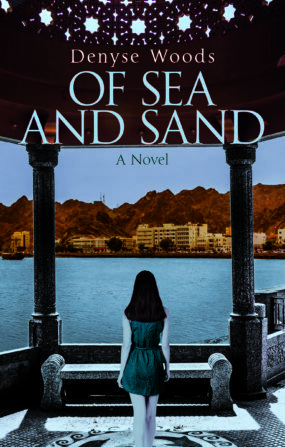 Her sixth novel, Of Sea and Sand, is set against the stunning landscapes of Oman, the wild Atlantic coast of Ireland, and war-time Baghdad. “It is a story of remorse, exile, love and the unseen,” explains Denyse Woods. Denyse Woods during one of her book signings. Photo by Eoin Heaney. 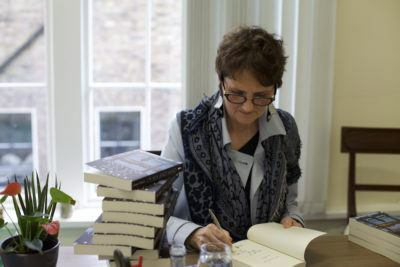 In her Seven Answers, Woods tells about her characters, the endings of her novels, and her main source of inspiration. What emotion brings out your best writing? I’m particularly moved by certain places and I enjoy the challenge of capturing them on the page. I grew up in different countries and became very conscious, quite early on, of the need to absorb every sensory detail, to imprint on my mind views, vistas, and faces, so that when I left them, they would never quite leave me. Although my books have often been commended for their sense of place, I never feel I’ve quite succeeded and so must continue the struggle of accurately depicting places that have made an impact on me: the magnificent wildernesses of the west of Ireland, the Australian outback, the mysteries and glories of a souq in Cairo or Sana’a, and of course, the desert. I come from a green, wet country, but there is nothing better than writing about a dry emptiness. Do you hide secrets in your novels that only a few people spot? Personal secrets? No. But sometimes I’ll throw some well-hidden clues into a plot. My first novel, Overnight to Innsbruck (2002) is about two people who lose each other while traveling in Egypt and Sudan. When they meet up again years later, their accounts of what happened in Sudan don’t add up—one of them is evidently lying. I opted for an inconclusive ending, allowing the readers to make up their own minds about which account was more plausible; but for the fun of it, I buried one tiny detail in one of the narratives, which, to the astute reader, would have made that character’s story untenable. Trouble is, I can’t quite remember now where I put the clue or what it was . . . .
Ah, almost as hard as choosing names for your children! Sometimes a character arrives into the plot with name attached, which is helpful. A protagonist’s nationality narrows down the options, of course, as can his/her year of birth, and so does pronunciation. It’s important that a name would be pronounced as it is spelled so readers will know how it sounds. This is particularly relevant with a lot of beautiful Irish names which, for a non-Irish reader, might be challenging—e.g. Caoimhe, Sadhbh, Fainche, or Daithi! So when using Irish names, I go for the more straightforward. (The Irish actress Saoirse Ronan constantly has to explain how her name is pronounced—“like inertia,” she says.) A well-chosen name will add to a character’s persona. In Of Sea and Sand, Gabriel’s name has all sorts of resonances and a moving backstory. His Omani friends call him ‘Jibreel,’ which also works. Often, I use names simply because I like them. I came across a ‘Thea’ when we were on the point of editing Of Sea and Sand and immediately renamed the female lead. Gorgeous, unusual name. How much of yourself is in your novels? Not much. I put very few of my actual experiences into my books, although inevitably, as with most writers, my life informs my writing. Although my novel The Catalpa Tree is entirely fictional, I know the territory – grief and loss – very well. But in Of Sea and Sand I took a leap and finally fictionalized some of my specific experiences because, well, they make for good stories. While I was in Baghdad in the eighties, I was, like Thea, subjected to repeated taunting phone calls in the middle of the night and I also became seriously ill with hepatitis and had to be shipped out with the war-wounded. Leaving was as heartbreaking as is depicted in the novel, but unlike Thea, my only love affair was with Iraq. Do you ever have second thoughts about how to end your novel? Working out the ending is the fun part and it usually comes to me early on. Sometimes I see the end of a story before I can see the beginning. I quite like an inconclusive ending—no doubt influenced by John Fowles’ The Magus, the ending of which thrilled me when I first read it—because it allows the reader to draw their own conclusions. As for having second thoughts, my publisher once had second thoughts on my behalf, when one of my novels ended with a question mark for the reader. He felt it was too frustrating and should be changed. He was right too, because on another front, with a more conclusive ending, the story ultimately made more sense. The old Irish saying, ‘Count your blessings,’ works for me. If we have a roof over our heads, food on our plates, and our loved ones are safe and well, then we are deeply privileged and it’s good to keep that in mind. Is it an idea or a character that makes up the main source of inspiration for a new book? Usually it’s a place, which probably isn’t surprising, given the various settings in my novels. A story often comes to me first as a kind of tableau: a scene, a set up. It’s like watching a trailer for a book that hasn’t yet been written. I see a place, maybe some people, and I step in to see what’s going on. Of Sea and Sand certainly started with one such image—a man looking through the window of a small house at the woman within, but when he then went into the room, she wasn’t there. I decided to follow him and found myself in Muscat.